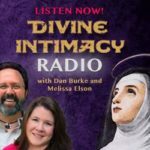 Join Dan Burke and Melissa Elson as they answer questions from listeners about transitioning from the purgative way to the illuminative way, recognizing sin, and the importance of mental prayer. How do you know if you’re making the transition between the purgative and illuminative way? How do we know if we are committing mortal or venial sin? If we had to choose between going to Mass, praying mental prayer, and the rosary, which is most important? Should you pray while doing other tasks? Questions? Send an e-mail to Questions@myavila.com or call 818-646-7729. Please leave your name, your location, and your question(s).